Mignon Mary Hickey, age 94, of Honolulu departed on February 2, 2018. Born and raised in Detroit, Michigan, resided in Honolulu and Las Vegas. The name "Mignon" is French and means, Darling. Darling truly described Mignon. Beautiful and charismatic, with her constant dimpled smile and sparkling blue eyes. Friend to everyone. Kind and generous, intelligent, talented and with an ever present positive outlook on life. People liked her! One of her first jobs was as a teenage candystriper volunteer at Deaconess hospital near downtown Detroit. Assigned to the nursery she cared for new born premature babies with love and devotion. 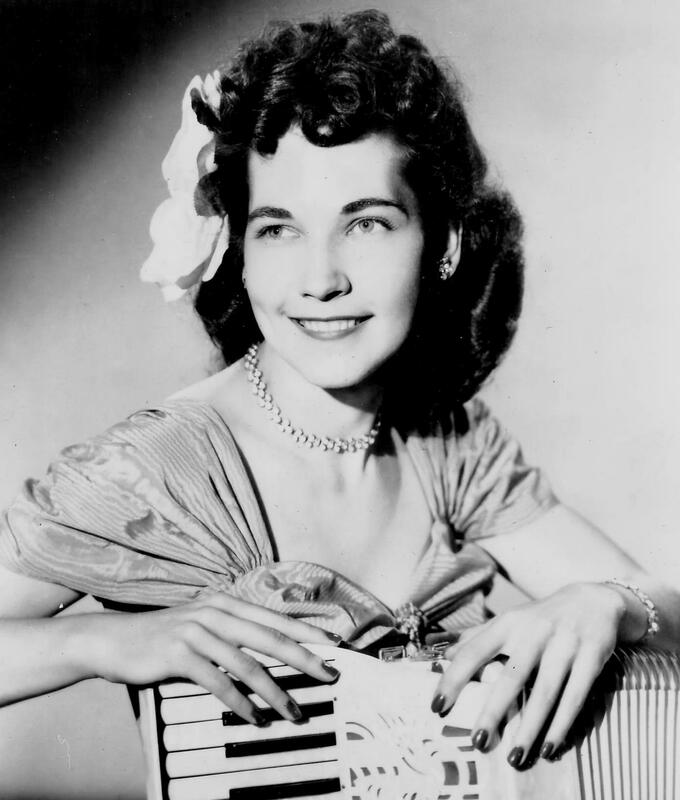 She was a professional entertainer playing accordion and singing with a lovely voice. One of her favored songs was 'Kak Stranno' a Russian love song which she sang perfectly and in Russian. Spanish songs were also in Mignon's repertoire. Promotional advertisements described her as, 'The Pleasing Personality Girl'. Young Mignon was very bright, skipping grades up through high school and completing her education at Wayne State University Secretarial School. She went on to become a sought after executive secretary and bookkeeper for many of Detroit's prominent business people. Dynamic and ahead of her time when few women had careers. An accomplished floral designer who created unique designs and taught flower arranging in adult education classes for many years. Mignon had a green thumb, her gardens in her many homes were always stunning. As a realtor in Honolulu, Mignon owned and ran a property management company, 'Apartments Waikiki'. She met guests at the airport and showed them the beauty of Oahu. As a world traveler she knew the importance of hospitality. Her apartments were always in tip top shape. Returning to the Russian songs she loved Mignon Hickey produced "Folk Songs of the Balkans" with Herb (Ohta-San) Ohta. A record Album featuring Ohta-San on Ukulele. As a contributing member of Unity Church she found a positive and practical Christian life which she attributed to her health, prosperity, happiness and peace of mind. Hobbies include: Raising Pekingese dogs and singing canaries, playing piano and ukulele. Completing the most difficult crossword puzzles each day and in ink. Her favorite card game - Pinochle, she enjoyed trying a new recipe, reading a good book, chatting with an old friend. Long time member of 'The Grandmothers Club' in Honolulu. Her favorite saying: "When one door closes, another opens". Mignon is preceded in death by her husband Lt. Col. Charles Hickey and is survived by sister Marilyn Steelman of Nevada, Cousins Donna and Marilyn, Beloved Children; Charles and Mignonette, Grandchildren; James, Jonathan, Stephanie, Jeffrey, Logan, Mariah and Great Grandsons; Morgan, Marcus and Felix. Interment, Punchbowl National Cemetery Of the Pacific. Donations: Leahi Hospital, 3675 Kilauea Ave. Arrangements, Borthwick Mortuary.